Sir Trogsdill Domnall (aka Trog) is the most revered knight in Fallhollow, and General of the King’s army. He stands almost 7 feet tall and is muscular and broad. With dark hair and peridot eyes, he appears supremely confident but has a sensitive streak he struggles to hide. He is perceived as demanding, intolerant and domineering by young pages and squires, but he is admired nonetheless. He is confident, aggressive, fearless, charismatic, and while you are in his presence, you will be served up with generous doses of chivalry, courtesy, gallantry, care and warmth. His enemies see him as lethal, and the sound of his name sends chills up their spines. He dislikes people fawning over him, and is most at home in a small cabin with minimal possessions. 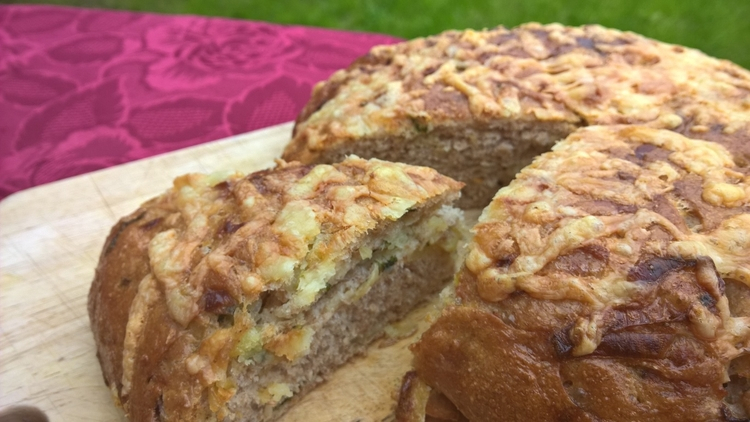 This hearty and savory Potato, Leek and Cheese Bread is sure to satisfy Trog’s medieval hunger, especially if he throws in a slab of deer and a mug of ale! 1. Place the flours into a large mixing bowl, put the yeast on one side, and the salt on the other. Add the butter and about three quarters of the warm water. 2. Using either your hands, or a mixer with dough hook attachment, bring it all together into a dough. Add more of the warm water as needed. Water is never an exact measurement in bread-making, you may need more or less than the 500ml. The dough should be soft, but not overly sticky. Knead the dough for up to 10 minutes until it is smooth and elastic – you can either do this with the mixer and dough hook or on a lightly floured surface by hand. I usually start the process with the mixer and then finish the last few minutes of kneading by hand to get a feel for when the dough is ready. 3. Lightly grease a large bowl with olive oil, shape the dough into a ball and place it in the bowl. Cover with a slightly damp kitchen towel and put in a warm place for about one hour until doubled in size. 4. While the dough is rising, prepare the veg. Thinly slice the white and very pale green parts of the leek. Peel and cube the potatoes into approx 1cm cubes, place the cubed potatoes into a bowl of cold water until ready to use to avoid discoloration. Roughly chop the parsley. 5. 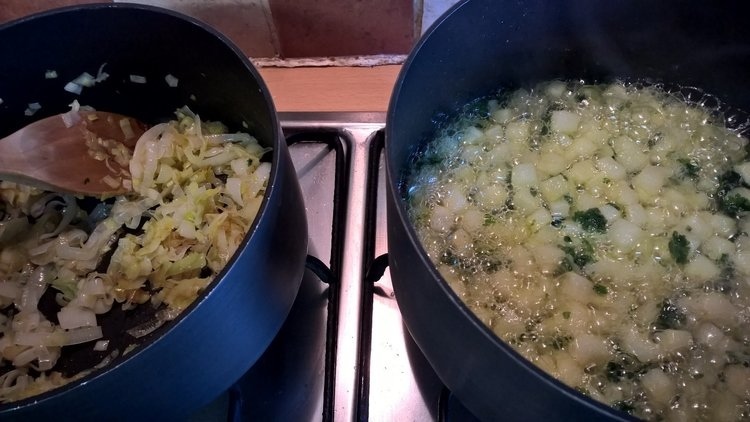 Melt the stick of butter and two tablespoons of the olive oil in a pan, add the potatoes and on a low to medium heat cook them, shaking the pan around occasionally, after about 10 minutes add the chopped parsley and keep cooking. In a separate pan, warm the remaining tablespoon of olive oil and cook the leeks, stirring regularly. The veg is done when the leeks are just starting to caramelize a little, and the edges of the potato cubes are turning brown. It may take up to 20 minutes. Time it so that the veg finishes cooking around the same time as the dough finishes rising because you want the veg to still be warm. Drain the potatoes on some kitchen paper. 6. Tip the dough onto a surface, tip the warm veg over it, and work it into the dough. At first this will feel like an impossible task as the veg will keep dropping out, but persevere, and after a few minutes, as the potatoes start to break up a little, it will all come together and the veg will incorporate. 7. Divide the dough into three and shape into balls. Stretch them out to approximately 20cm rounds, place onto baking sheets lined with greaseproof paper, and score the top quite deeply to create wedges. 8. Cover each a with lightly damp kitchen towel and leave for around 40 minutes to rise again. 9. 20 minutes before rising is finished, turn the oven to 425F/220C, and place a baking tin in the bottom (a large roasting tin is best, but if you have a smallish oven then a loaf tin will be fine so that you can still fit one of the bread trays next to it). 10. Remove towels from loaves, brush with beaten egg and scatter the cheese over the top. 11. Place the loaves in the oven, pour the 300ml cold water into the heated tin. The steam from that water will help create a crisp crust on the bread. 12. Bake for 25-30 mins until golden brown, and hollow sounding if you tap the loaf on the bottom. Place on wire racks to cool a little. Best served warm. Looks like the perfect dish to enjoy in a people-less small cabin. I’m in! I agree, Carrie. It’s a perfect comfort food. That sounds really good. Did the potatoes get all the way finished that way? The potatoes were completely cooked through in the butter first. I can’t bear potato that is undercooked, even just a little, and I wasn’t sure how much more they would cook inside the dough, so I didn’t want to risk it! This sounds really good – hearty! 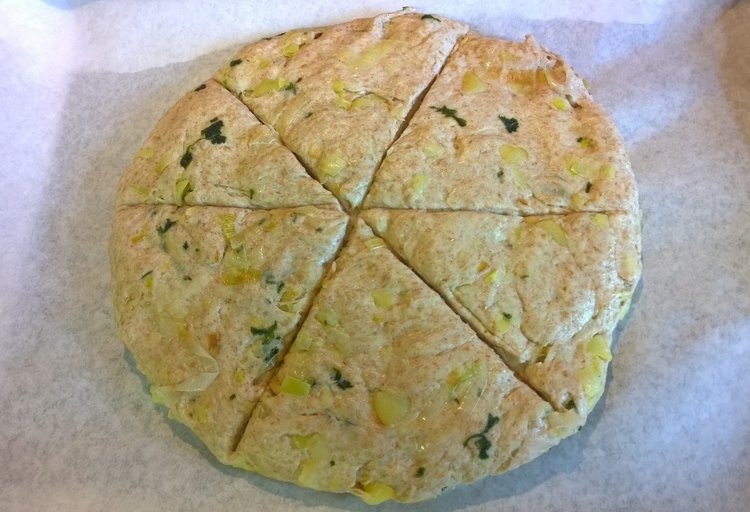 I’ve been watching The Great British Baking Show, and awhile ago they had to make a vegetable bread of their own devising. If you were on there, you could make this one! I love The Great British Bake Off, it’s one of my favourite shows. It’s been a huge hit over here, much more than anyone expected when they first made it. I think I remember that vegetable bread. Mmmmm I wonder if Trog will share? This sounds tasty! (So does Sir Trog, if I’m honest.) 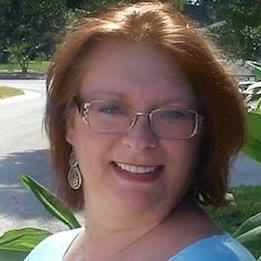 Thanks for sharing, and good luck with NaNo, Vanessa! Oh, he is a yummy morsel himself. I’ve toyed with writing an adult novel with him as the main character, but I don’t know if I could share such a delicious delight. He’s kind of like cheesecake. You shouldn’t have so much, but you just can’t stop coming back for more. That looks really yummy. Not sure I’d have it with a slab of deer, although the mug of ale sounds like a divine complement! A mug of ale just sounds so much more enticing than a bottle of beer doesn’t it! Hearty is just what we need in winter isn’t it!